Books of the week — Off with her head! 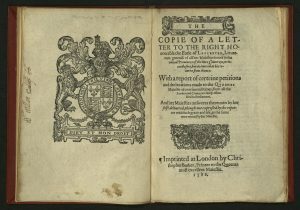 A contemporary report of William Parry’s plot to assassinate Queen Elizabeth I (1533-1603), including an account of his discovery, imprisonment, confession, and execution (2 March 1585) together with documents of the confession of Parry’s fellow-conspirator, Edmund Neville (ca. 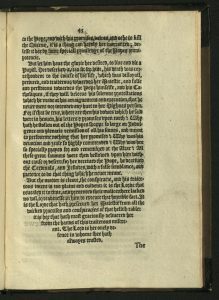 1555-ca. 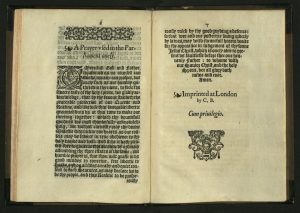 1620), outlining in detail Parry’s plans to kill Elizabeth with his dagger in her private gardens or, failing that, to shoot her at St James’; and Parry’s confession, written by his own hand before Walsingham in the Tower of London. 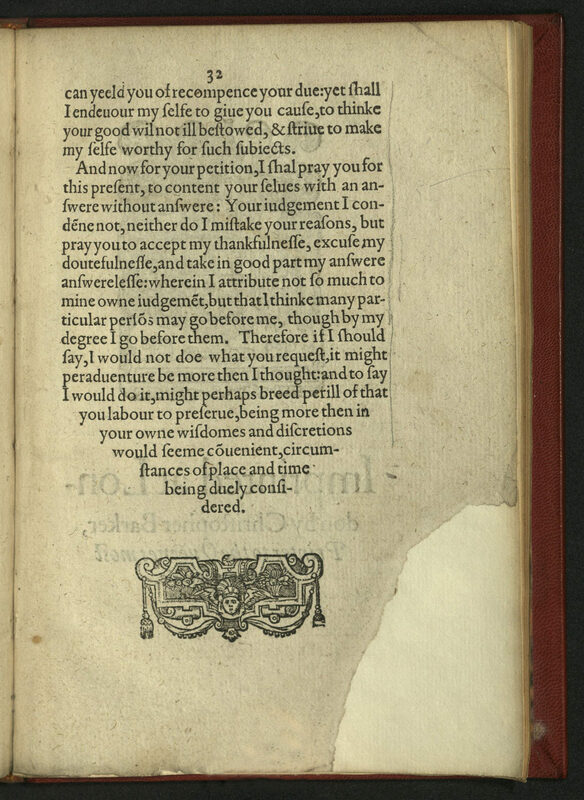 This is followed by two more letters of confession by Parry, the first addressed to the queen; the next addressed to Burghley and the Earl of Leicester. Also included are documents that further incriminate Parry and provide details of the early stages of his plotting. 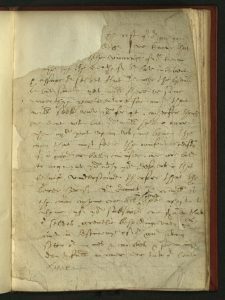 The first of these is a letter written by the Jesuit William Crichton (from his imprisonment at the Tower) recalling a conversation with Parry concerning the lawfulness of assassinating the queen. Finally, a letter to Parry by Ptolomeo Galli, Cardinal of Como, in which he approves a letter that Parry had written to Pope Pius V, allegedly offering to assassinate the queen, and for which service the Pope granted him a plenary indulgence. 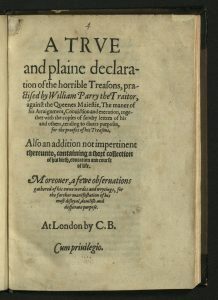 Following the account of Parry’s trial and execution by hanging, the printer has added “A few observations gathered out of the very words and writing of William Parry, the traytour, applied to prove his trayterous coniuration, with a resolute intent, imagination, purpose, and obstinate determination to have killed her Maiestie.” This account of Parry’s efforts implicates the Jesuits, English recusants and seminarians, and the Pope himself. 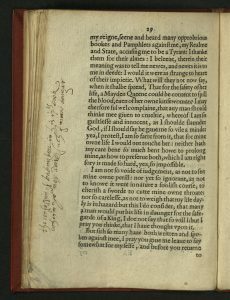 A few days after this exchange, Elizabeth “in some conflict with herself what to do” asked the Parliament to find “some other way of remedy” than the execution of Mary. In the resultant second petition (24th November), Parliament announced that further deliberations upon the matter yielded no alternate solution that would ensure the safety of queen and country. 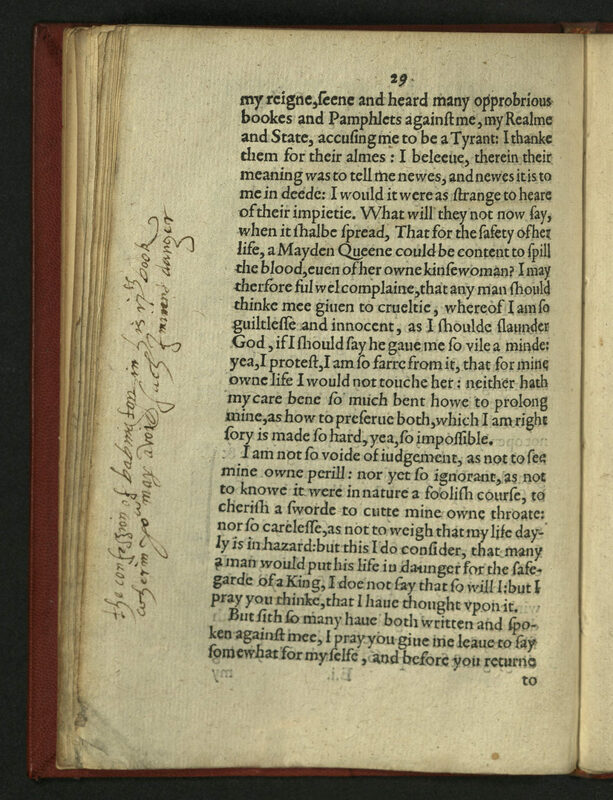 The queen was once again urged to authorize Mary’s execution. 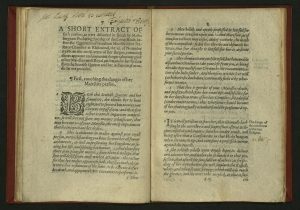 Elizabeth’s equivocal response to the November 24th petition concludes the present work. 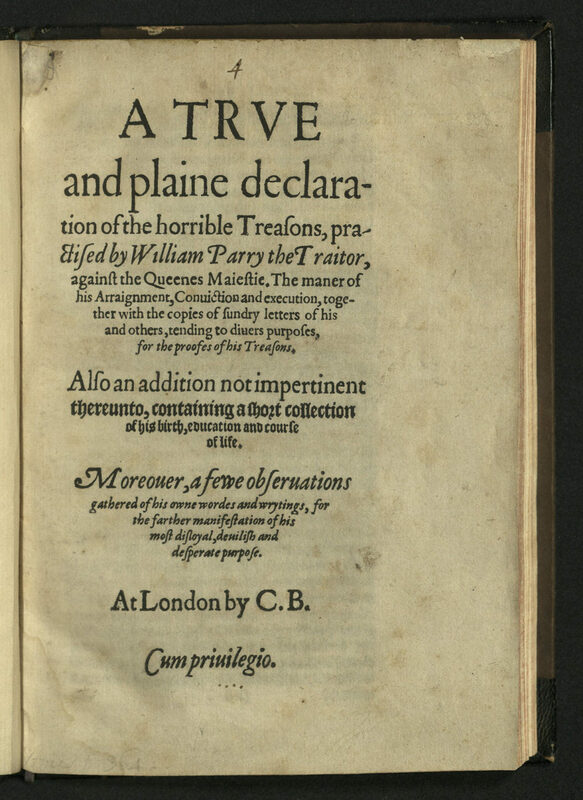 Soon after, on December 4th, Parliament obtained a public proclamation from Elizabeth of the sentence of death. Mary was executed on February 8th, 1587. 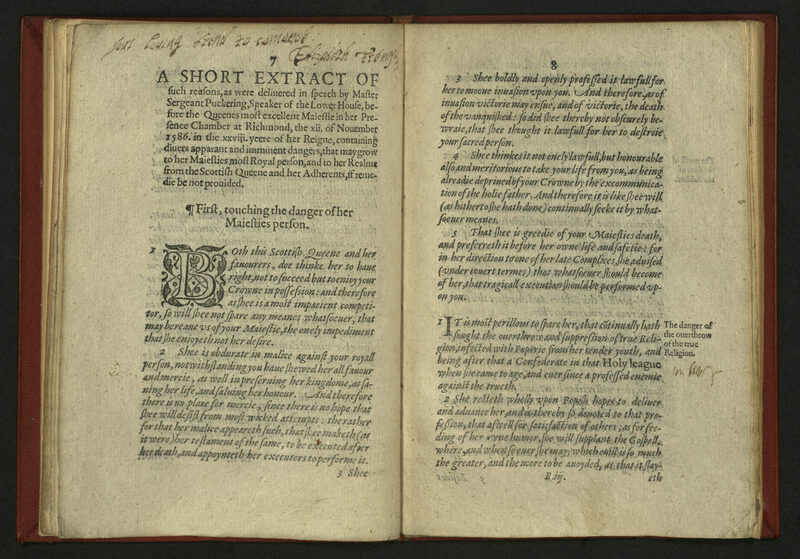 Rare Books copy has contemporary handwritten annotations in the text. 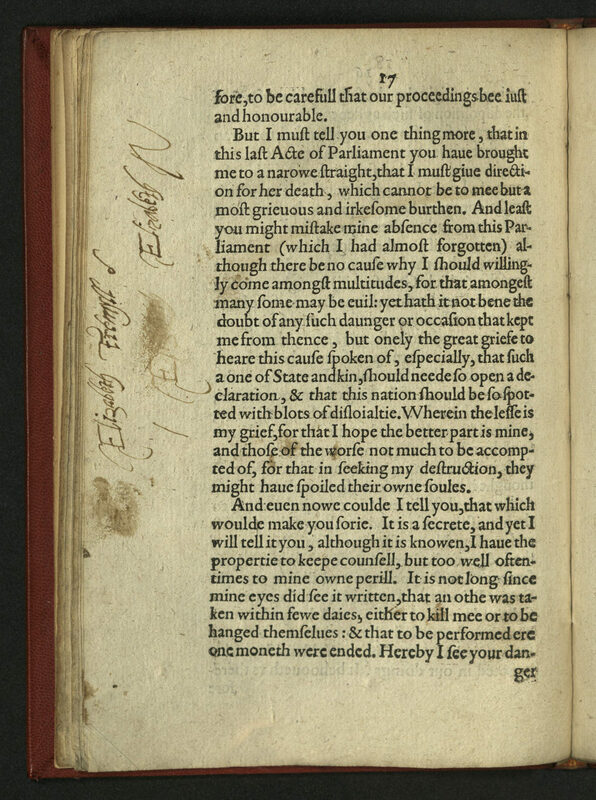 In the first, the annotator directs the reader to the confession of Anthony Babington, who had conspired to kill Elizabeth and place Mary, Queen of Scots on the English throne. Babington was captured and executed in 1586, the year that this book appeared. 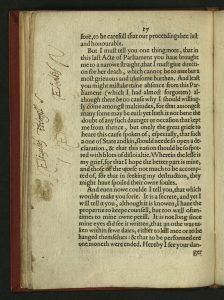 Three other annotations give the names of contemporary owners. 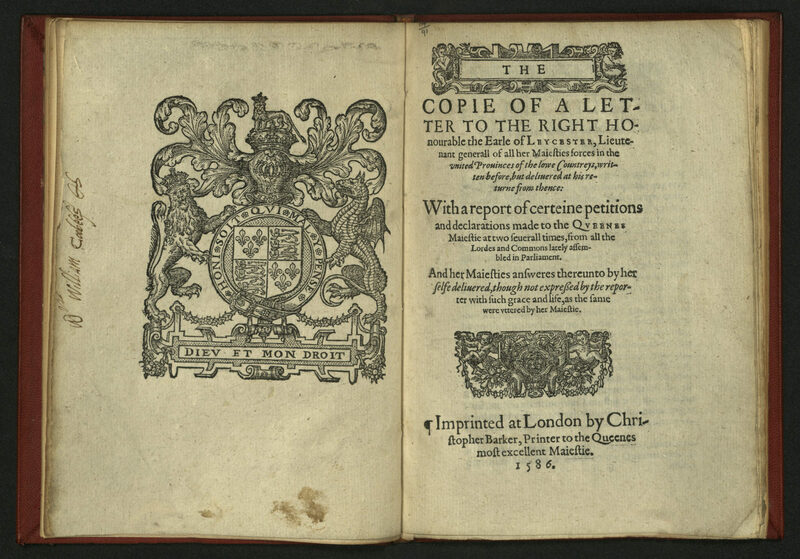 The arguments are set-out (1) by [the Lord Chancellor] for the Lords…much perturbed by the revelation of the “Babington” plot…Queen Elizabeth’s characteristic replies are prefaced by a letter signed R. C. to Lord Leicester. 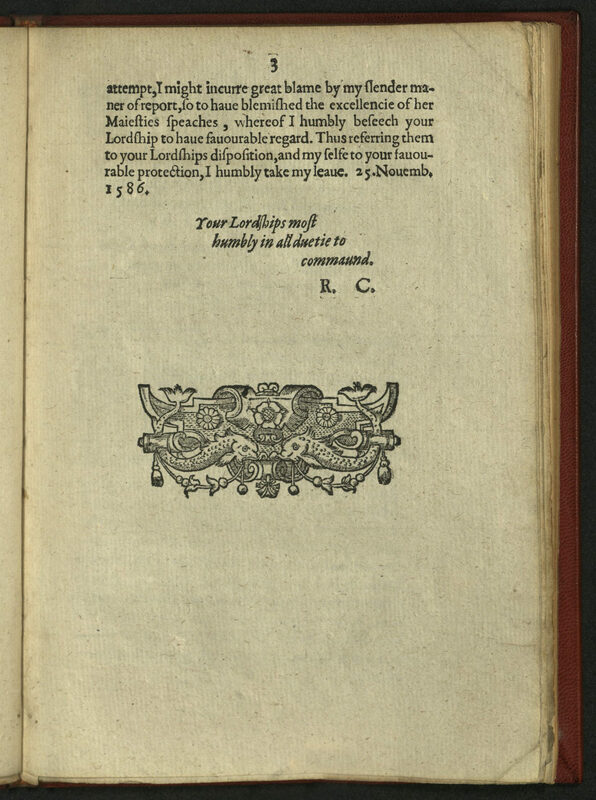 Lord Leicester had been in Flanders during these events and this volume was printed by the “official” printer to acquaint him with what had passed in this matter in his absence. 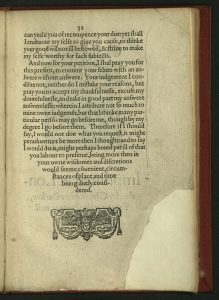 Sir Robert Owen of Brogyntyn (d. 1698) was a bibliophile who followed a family tradition of patronage of poets and collecting printed English literature. Later family members continued collecting early printed books. The library also had a collection of manuscripts, possibly culled from other estate libraries in the surrounding area. The third Lord Harlech gave thirty Welsh language manuscripts to the National Library of Wales in 1934, making it the largest collection of manuscripts in Welsh at that time. The fourth Lord Harlech gave the National Library another fifty-nine manuscript in 1935 and more in 1945. The remaining manuscripts were purchased from the sixth Lord Harlech in 1993. 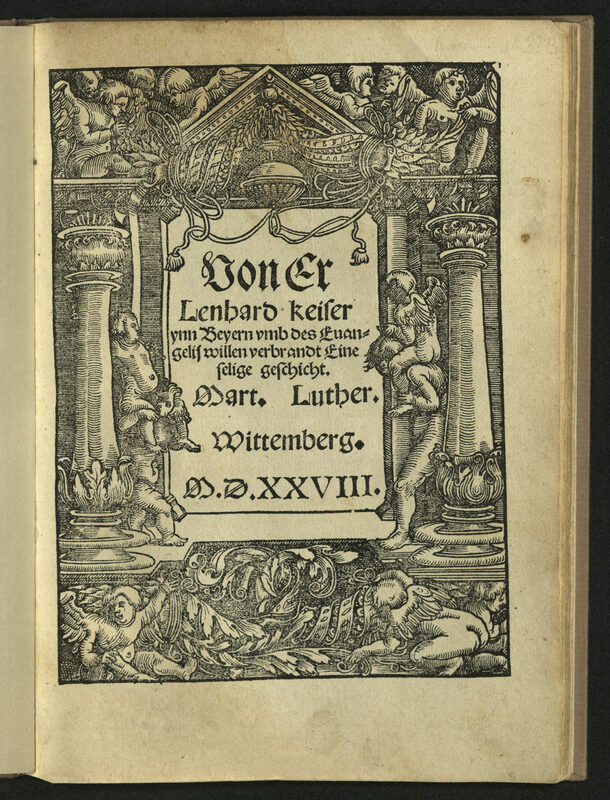 Leonhard Kaiser (1480-1527) studied at Wittenberg. 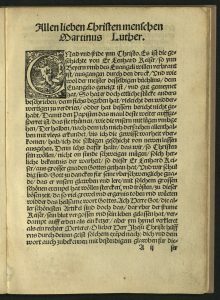 He spread Martin Luther’s message through letters and books that he sent to friends. 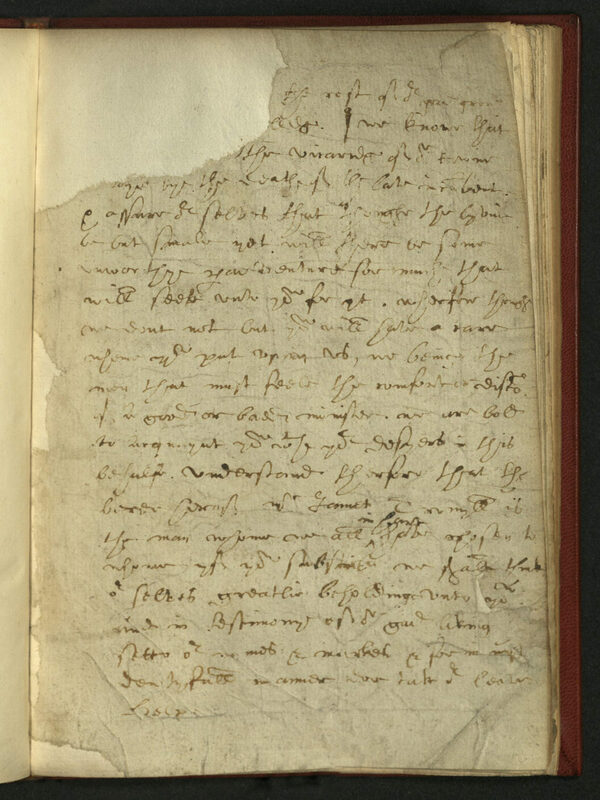 While visiting his dying father in Raab (Upper Austria), in 1527, he was arrested, imprisoned and interrogated. Kaiser had been openly preaching Lutheran doctrine. 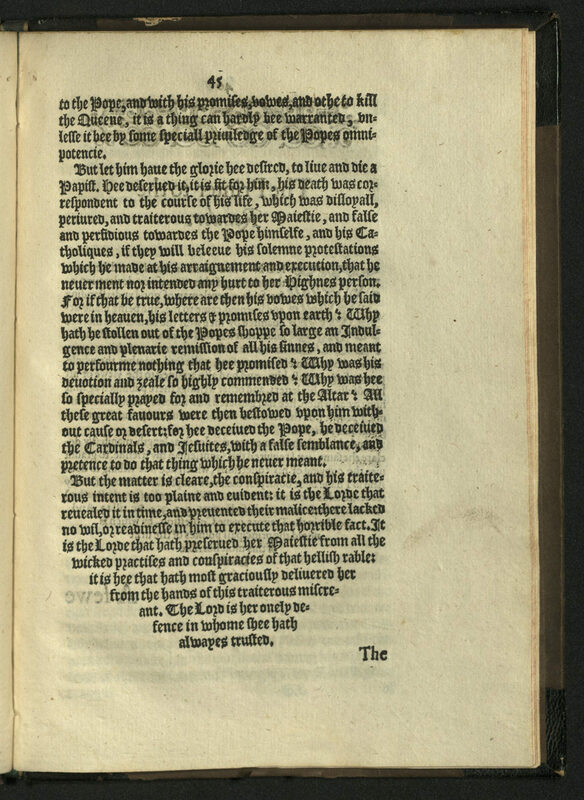 Charges against him included teaching justification through faith alone and other heresies; including his disapproval of confession and other sacraments, freedom of will, purgatory, the invocation of saints and the power of the papacy. 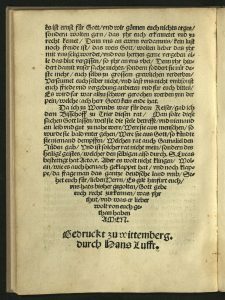 While Kaiser was in prison, Luther sent him a letter of consolation. Kaiser was burned at the stake in Bavaria on August 16, 1527. 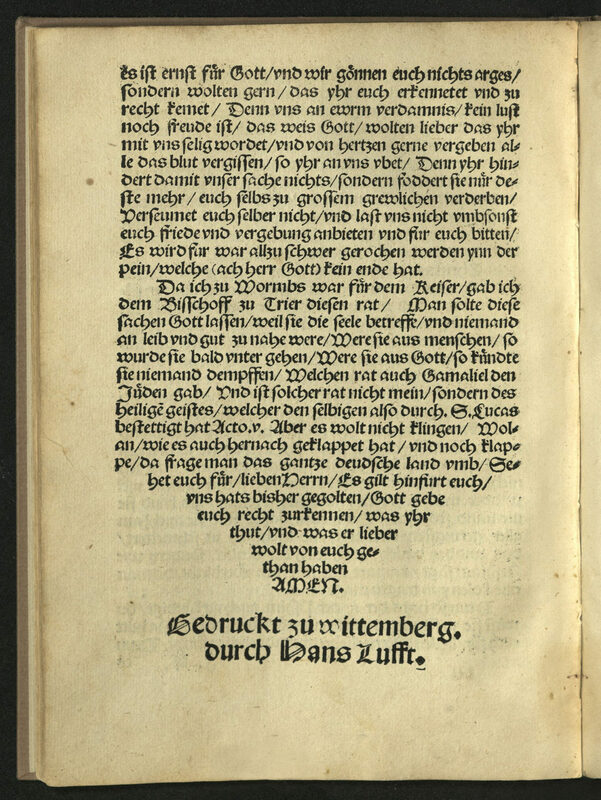 This volume contains Luther’s letter to Kaiser, and a preface and conclusion by Luther; and a letter from Elector John of Saxony to the Bishop of Passau appealing for clemency on Kaiser’s behalf. The author of the account of the martyrdom itself is unknown. Kaiser’s execution quickly became infamous. This text was reprinted nine times in quick succession. 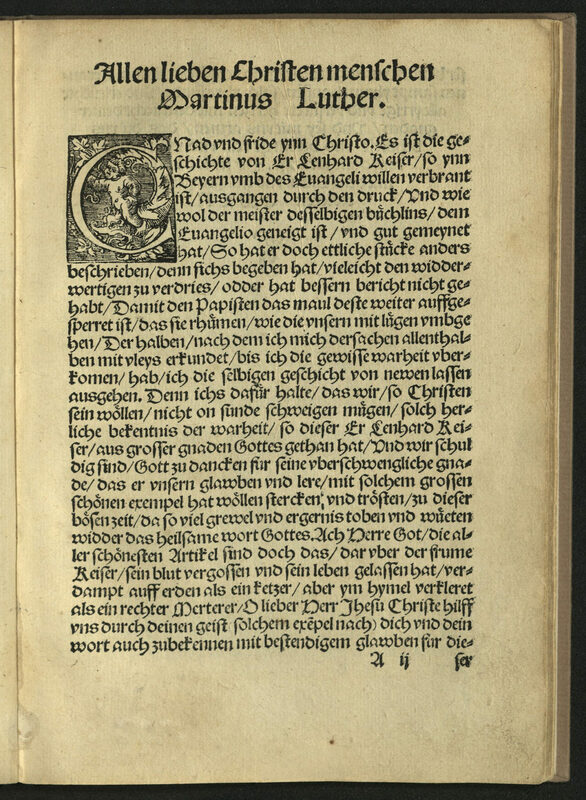 The printer, Hans Lufft, printed the first complete edition of Luther’s Bible. 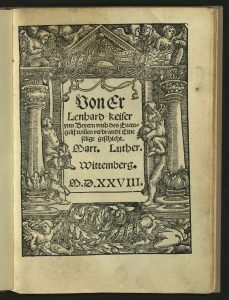 A woodcut title border by Georg Lemberger contains architectural elements, garlands, and cherubim.